Join us Friday, February 17th, 5-8pm, for a FREE wine tasting! Blindfold 2014 White Blend from Prisoner Wine Co.: From the makers of the Prisoner Red Blend, comes this bold and elegant white wine made mostly of Chardonnay and a blend of aromatic varietals (Roussanne, Viognier, Grenache Blanc, Chenin Blanc, and Marsanne). The wine is complex with inviting aromas of honeysuckle, grilled white peach and apricot. A luscious entry of toasted hazelnut and mandarin are balanced by bright acidity and minerality. The finish is rich and creamy with flavors of lemon zest and caramelized sugar. Pair this wine with savory dishes such as pumpkin risotto or fire-roasted vegetables with Béarnaise sauce. 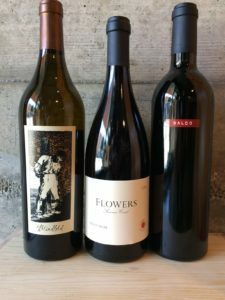 Flowers 2014 Sonoma Coast Pinot Noir: Perched on coastal ridges that border the Pacific, Flowers’ estate vineyards were some of the first planted on the “extreme” Sonoma Coast in 1991. The maritime breeze and coastal fog make the site perfect for growing Chardonnay and Pinot Noir, allowing fruit to ripen evenly in cool conditions. Their 2014 Sonoma Coast Pinot Noir is a blend of fruit from vineyards in the appellation, including Sea View Ridge. It has a deep garnet hue, with aromas of wild strawberry, pomegranate, along with savory herbs and forest floor. Layers of blood orange, hibiscus, and fine-grained tannins make up the palate, followed by a lengthy finish replete with minerals and bright acidity. Pair with grilled salmon and a Brussels sprout slaw. Saldo 2014 Zinfandel by Prisoner Wine Co.: Also from the maker of The Prisoner comes this prototypical Zinfandel, sourced from northern California’s oldest dry-farmed vineyards in Mendocino, Sonoma, Lodi, and the Sierra Foothills. The word Saldo is of Latin origin, meaning “from here and there.” The wine is dark ruby in color with aromas of blackberry, plum, and clove. A rich, juicy palate of cherry, vanilla, and Mexican chocolate leads to a silky smooth finish. Pair this wine with Gal-Bi, Korean-style barbecued short-ribs.